COTTAG3: Vintage, cottage, french and shabby chic meet Texas! Vintage, cottage, french and shabby chic meet Texas! Behold, the vintage cottage horseshoe. Although western decor is not my style, I am a born and raised Texan and proud of it. 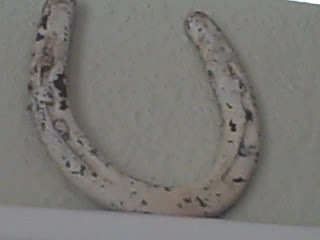 So, I have these creamy white chippy authentic horseshoes hanging in my house. 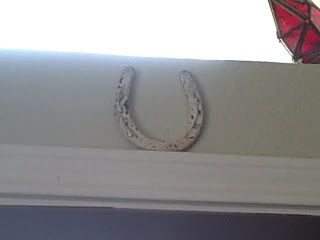 Some believe that a horseshoe hung above or beside a door, open-end facing up, catches and holds good luck. 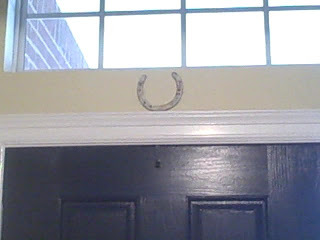 Others believe that a horseshoe hung above a door, open-end facing down, rains good luck on anyone who passes under it. 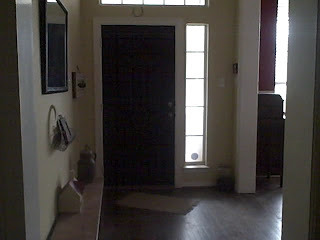 We have a horseshoe hanging above both the front door and back door. Clean, new horseshoes and rusted, brown horseshoes are common but these white ones are more me. I did not paint them. This is they way I found them and they add just a little bit of Texas to my lil' ol' cottage. These were $2.00 each for a total cost of $4.00. However, you can often get used ones for free. So for the cost of a can of spray paint, you could have one above your door for good luck. Look closely and you can barely see it above our front door. Just found your blog! Love ANYTHING chippy and white! I am sure it will bring much happiness and luck to your home! oh, my husband would love a horshoe for his mantown- him being Irish and all! Hi! 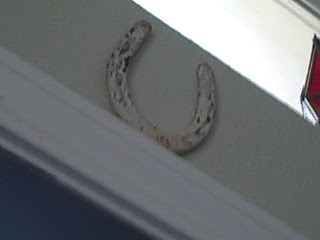 I love the horseshoe-we a found one just lying around when our last house was built. I think the property used to be a farm. I wonder where I put that horseshoe when we moved...Love your blog! We could all use a little extra luck! I love this idea, and will now be on the lookout for a horseshoe. Thanks for sharing! Lovin the "white" horseshoe, going to have keep an eye for some, not to common where I am from, probably why I like it so much! and thanks for linking up to FREE FRIDAY! hope your back next week! And may you always have good luck. My old business partner and I found a horshoe in our shop when we bought it, and the first thing we did was hang it open end up. I think it worked, we may not be rich but boy did we have fun. Happy bloggin. Looks lucky to me! -- Jane F.
What a great idea! We have a horseshoe laying out somewhere that I never wanted to put up but after seeing this, I'll revamp it and put it up. Thanks for the great idea! !